Info: Gigantic is a third-person multiplayer action game developed by Motiga. 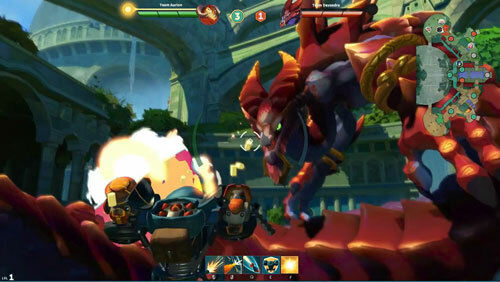 In Gigantic, five players charge across a fantasy battleground alongside their guardian, a five-story-tall monster they’ve sworn to protect. Players start by choosing from a roster of unique heroes that fits their gameplay style, then aim, dodge and leap across the map until they defeat the enemy guardian. Every battle in Gigantic lets players earn rewards, unlock new heroes and fine-tune the gameplay to fit their style. • Choose Your Own Guardian . A mystical bond connects the players to their guardian, a magical behemoth too powerful for a single mortal to defeat. Each guardian has its own attacks and behaviors, and players must protect their guardian to win the battle. • Level Up on the Fly . As the battle rages, players choose newer, stronger abilities and adapt to the changing battle. One player might learn to deflect projectiles as she rides a lightning bolt into battle, while another gains a fire attack that triggers whenever he leaps into the fray. • Fantastic Visual Style . Players are at the heart of a vibrant fantasy world, where airships soar over ancient ruins and an empire is theirs for the taking. • Easy to Learn, Difficult to Master . Familiar WASD controls are easy for new players to learn, but rapid-fire tactics and deep strategy keep the challenges fresh. • Content Updates Deliver New Gameplay Experiences . Gigantic is a living game, with frequent content updates ensuring there’s always something new to master. And “freedom to play” means players can experience Gigantic without dropping a dime.